Mr. Cue has lately managed crises related to Apple’s mobile maps and iCloud and iMessage outages. He has taken on iBooks and the iAd advertising service and oversees Apple’s App Store, which has more than 700,000 apps. He urged Mr. Cook and others that Apple should develop a smaller iPad based on his own usage of a seven-inch tablet, which Mr. Jobs previously denounced. This week, Mr. Cue faces a test of how well Apple can keep up in online services with the launch of a new desktop version of iTunes, which is expected as soon as Thursday. The new iTunes has been delayed a month by engineering issues that required parts to be rebuilt, according to people who have seen it. iTunes 11 was originally set for an October release but Apple announced it would be delayed until November. According to people who have worked with Cue, “he is more a strategist and tactician than manager,” akin to Steve Jobs, focusing on a few top priorities and preparing for the next product launch. He is seen as giving employees lots of freedom at first, then usually diving in himself to get things done, while ignoring smaller projects or personnel matters. Former employees recall the iCloud launch required data centre knowledge outside Apple’s circle of expertise and the development road was rock–but Cue remained calm and expressed confidence in employees. The WSJ notes Cue has spent time reorganizing his team and was directly involved in the recent firing of Richard Williamson, the manager in charge of Apple Maps, which happened roughly two weeks ago according to sources. He also tried recently to get external help from people outside Apple for within his portfolio, which is similar to what we heard yesterday from Bloomberg. 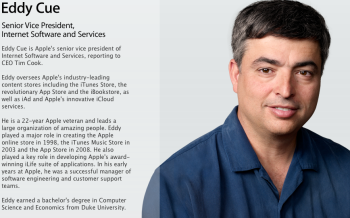 The Journal also notes veteran iTunes business executive Robert Kondrk has been promoted to vice president. iTunes 11. Coming tomorrow. Watch for it! Is That An iPhone 5 In Your Pocket, Or Are You Just Happy to See Me?